One of my most popular posts all year long – The Not So Newlywed Game. 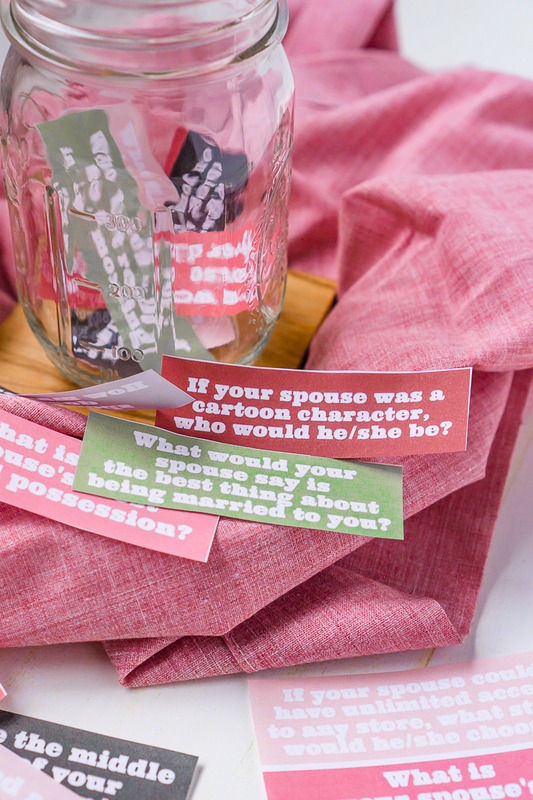 Sit down with your partner or group of friends and a copy of these Not So Newlywed Game Questions for a fun night and the chance to see how well do you really know one another. 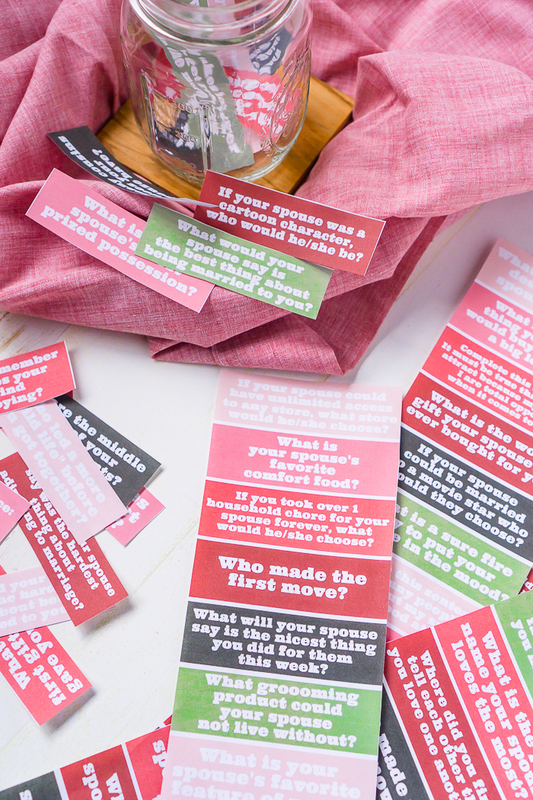 A Fun Couple’s Question Game to Test How Well You Know Your Partner! Our schedule leads itself to us spending a lot of nights in front of individual screens, especially since I work a lot at night while Liam is sleeping. Therefore, we make a conscious effort to schedule time for at home date nights. My favorite nights are the ones where we can take a little walk down memory lane while also hopefully learning something about each other. 10 years together there are definitely still things to learn, but it might take a little more effort to discover them these days. 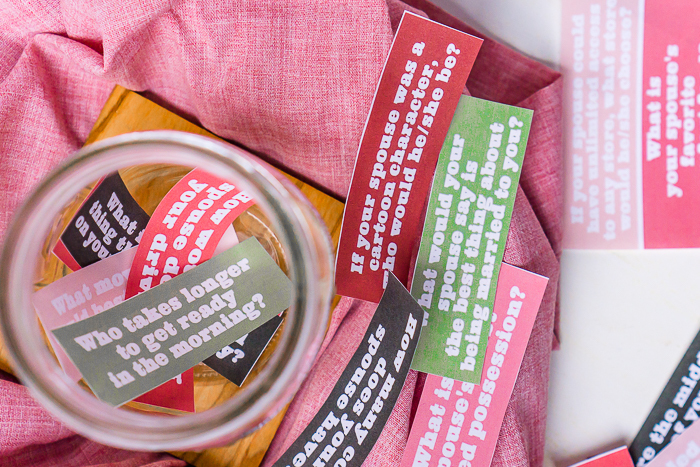 For one of our date nights at home, I created a Winter Cuddle Kit filled with lots of goodies for a cozy picnic inside, including an indoor s’mores kit and this question game for couples. The best part of the game is that it’s a great conversation starter! We naturally talk about similar topics every day, so it’s nice to have questions to spark different topics and memories. We had a lot of fun talking about what day of our marriage is our favorite besides our wedding (we both picked two different days during our honeymoon) and we got a good laugh from talking about the worst gift we ever got from the other (in the beginning, my husband gave me frozen pizzas for my birthday, which were a replacement for the ones he stole out of my fridge the week before). This might be Bryan’s favorite date night that we’ve ever done, so I’m adding it back into our 14 Days of Love for February this year which is a commitment we make to spend more time together in February with date nights at home. February is usually a down period between the holiday season and spring season which are both always crammed full of obligations so it’s the perfect time. I really love Couple’s Scattegories, too, so I’m adding that back in, too! 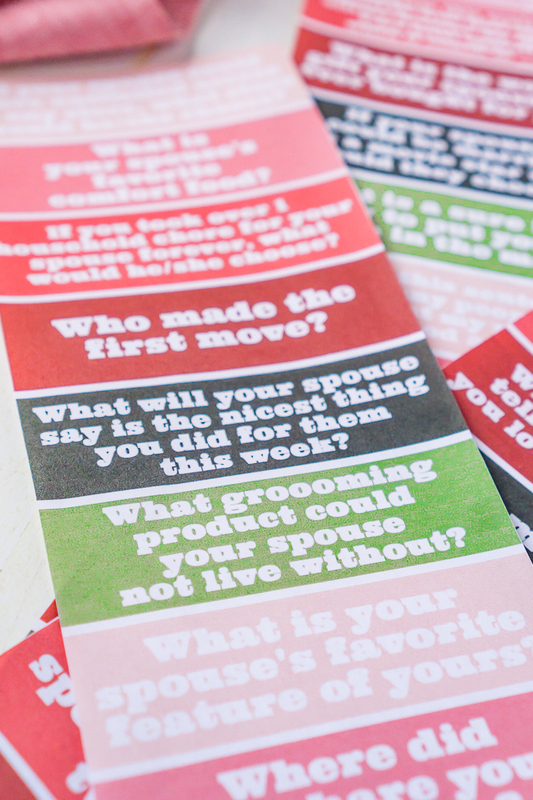 You can download your copy of the Not So Newlywed Game Questions at the end of the post! I always recommend using a laminator so you can play the game over and over again! To play as a couple, choose 10 different questions from the question bank and read each question out loud, letting both of you write your answers down on a sheet of paper before reading the next question. Make sure to keep your slips of paper in order! Once you have all your answers down, you can go through them and compare answers! If you’re ready for more questions after going through all 10, choose another 10 and start a second round. When your group is ready, divide the couple’s into group 1 or 2. You can do this by husbands and wives, first initials, birthdays, etc. Ask group 1 to leave the playing area. You want them to go somewhere where they cannot hear the questions being asked. Pull 10 questions and ask Group 2 (the group that stayed behind) one question at a time, having them write their answers down on a piece of paper. Once all 10 questions have been answered, bring back group 1. Now, ask group 1 the same question. You can do one question at a time, having this group write their answers down or just verbally speaking them in a row. (verbally works well for game nights with 4 couples or less) OR, you can follow the same format at #3 above, having them answer all 10 questions before comparing answers. If the couple’s answers match, they get points. I recommend making each correct answer 1 point to keep it simple! Who Dun It Date Night? DOWNLOAD YOUR COPY OF THE NOT SO NEWLYWED GAME HERE!!! Why doesn’t the pdf link work anymore? I would use it for a plane ticket for my daughter to come home from college during her break. First, thank you for the chance to win such an awesome prize!! If I happen to win, I would love to do something nice for my mom and my husband. Perhaps take a mini trip! Again, thanks and have a blessed day! Summer vacation, baby! We have a teen who needs to do college visits this summer and this money would be used towards that! I’ll be using the money on dog shelters donation. Thanks for the chance. What a great game! Sounds like fun to play. Thanks for sharing it and making it printable!